Bangor P.F. Church, Churchtown, PA. 1909 The Episcopal Diocese of Central Pennsylvania is comprised of 24 counties and stretches from the Mason-Dixon Line in the south to the New York border in the north. The Diocese is led by The Right Reverend Dr. Audrey Cady Scanlan who was elected by the Diocese in March 2015, and consecrated in September 2015. Bishop Scanlan is the eleventh bishop of the Diocese of Central Pennsylvania. The Diocesan Center is located in downtown Harrisburg and is joined by St. Stephen’s Episcopal Cathedral (founded in 1826), and St. Stephen’s Episcopal School, on the same city block. Our Diocese traces its history from before the American Revolution. This history begins with our Mother Church which is located in Caernarvon Township, Lancaster County. The Episcopal Church of Bangor in Caernarvon was founded in 1722. 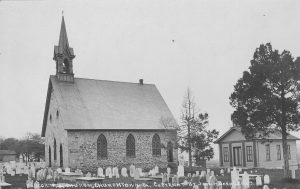 With a congregation comprised of mostly Welsh immigrants, early Bangor church services were held at the homes of the settlers or in shaded outdoor areas. Bangor Church is active today and endures as a symbol of strong faith within and beyond the Diocese. In 1787, The Rev. William White, Rector of Christ Church, Philadelphia, became the first Bishop of the Diocese of Pennsylvania. At that time, the Diocese encompassed the entire Commonwealth. In successive years, the Diocese underwent geographical divisions and, today, there are four dioceses in the state (Central Pennsylvania, Pittsburgh, Pennsylvania, and Bethlehem). Currently, there are 65 congregations in the Diocese of Central Pennsylvania. The Diocese is composed of seven unique convocations. Each convocation is identified by a geographical region and is comprised of 7 to 14 congregations. The list of convocations includes: the Northern Tier, West Branch, Altoona, Southern, Susquehanna, Harrisburg, and Lancaster. These convocations symbolize the diverse cultural, social, and economic aspects of the parishes within their regions. The seven separate convocations unite as one to form the Diocese of Central Pennsylvania and to carry out the mission of connecting and nurturing parishioners beyond regional boundaries. Guided by God’s “Spirit of Mission,” the people of the Diocese of Central Pennsylvania will step boldly into the world to bring others to Christ’s life giving love and hope. This is “Our Covenant of Faith” with God.